Fall is my favorite season! I love the colors, the weather, the food...the list can go on. This year marked the first year I have been to a pumpkin patch. Seriously, this is what heaven looks like to me! Look at all of those glorious pumpkins! We went with our good friends to pick out the perfect pumpkins and squashes to celebrate the season! As I write this, I realize how strange it is that I really have not cooked acorn or butternut squash more than once before. I also found a new squash for me...buttercup squash (also called autumn cup). I love the flavor and texture of the buttercup. 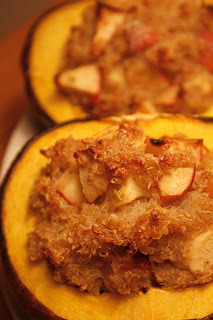 It was a cross between pumpkin and sweet potato in flavor and texture! I was really impressed by the amount of meat that was actually in this thing. I roasted it exactly how I did the pumpkin and it came out perfectly! Let's just say that this is the season that I get my fair share of vitamin A in Beta Carotene. Who says you can't get a nice glow during the cooler months...without the use of self tanners! We picked up some decorative gourds to enjoy throughout the season. 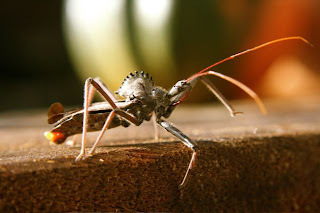 Some were pretty crazy looking. We got a couple that looked like chicken feet! I love the variety in shapes and colors! There was no way I was leaving there without getting a sugar pumpkin for roasting. This is the first time I roasted a sugar pumpkin. Last year, I roasted a large pumpkin and I thought it turned out so well. I wanted to see the difference in the roasted sugar pumpkin. Other than the color...I could not tell a difference in flavor. The color was a lot darker and richer in the sugar pumpkin. So, if you can't find a sugar pumpkin to roast, you can still get the larger ones that you find at the grocery store. This is the scoop before it went into my pumpkin oatmeal. My favorite fall breakfast! Now, for my acorn squash experiment. While this looks like a long difficult process, it was actually pretty easy because everything is done while the squash is baking...then you just have to wait. The great thing is that this can be prepared up to the last baking ahead of time. So, the biggest question I get from most people is..."how do you get enough protein in your diet". Well, I will say it again...you can get protein in more foods than just meat! I have really started to spread my wings when it comes to food. I think it takes a bit of a cooking slump and the purchasing of different ingredients to force you to start playing around. I knew I wanted to stuff the acorn squash with something. It is the perfect vessel for an all in one meal. So, I started to consider my meat free protein options to go with this slightly sweet squash. I should also tell you that I am more of a sweet person when it comes to these types of squashes. I just can't do the savory thing with it...that is just my taste. Back to my thought process. I looked in the pantry and realized I still had some quinoa. Ok, now that was perfect! A grain and a protein all in one. Then the wheels started to spin. The same friend that we went to the pumpkin patch with, also happened to share some apples with me that she had gotten from an apple orchard she visited just recently. Now, I had a plan! This was the perfect fall meal to enjoy the flavors, smells and colors of the season! Wash, cut in half, scoop out the seeds and stringy pulp. Roast at 375 degrees in 1 inch of water with the cut side up for 30 minutes. Rinse the quinoa really well to remove any bitterness. Then, place quinoa in the water and bring to a boil. Reduce heat and simmer for 15 minutes or until all of the liquid is absorbed. Next combine the quinoa and apples. Then place half of the mixture in each half of the squash. Then sprinkle 1/2 tsp granulated pure cane sugar on each half of the squash. Bake for an additional 45 minutes. When I ate this, I needed a little more sweetness. I poured a little maple syrup on it. It is up to you how sweet you want to go. The quinoa and cane sugar made the most wonderful crust on the top! This little critter was visiting while we shot photos of the acorn and butternut squash. You can see the squashes behind him. I love how the colors of the squashes enhanced his colors. I could basically live on acorn squash. OK, maybe not, but I always want it! It is really great if you fill the cavity, wrap it in foil and put it on the grill. YUM! I have three acorn squashes to use up, so I had better get busy! 'Tis The Season For Caramel Popcorn!